Lincoln, NE – Last year, a study identified a list of water projects ranging from a building a new reservoir and upgrading irrigation canals in western Nebraska, to stormwater and sewer improvements in the east. Now, Sen. Tom Carlson of Holdrege, chairman of the Natural Resources Committee, wants to come up with a strategic plan for the next 20 years. Legislation he introduced would create a task force to recommend which projects to do first, and how to pay for them. Carlson estimated water projects could cost $50 million a year over the next two decades. 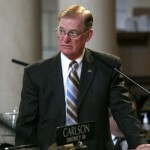 Sen. Tom Carlson of Holdrege, chairman of the Natural Resources Committee. 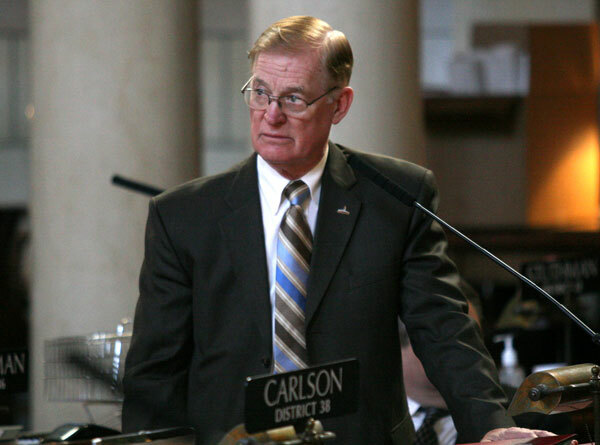 Omaha Sen. Scott Lautenbaugh, a Republican, disagreed that roads funding was hurting school aid. “I will defy any of you to look at the preliminary budget and find where these draconian cuts are taking place to fund what we did,” Lautenbaugh said. Under the latest proposal by the Education Committee, school aid, mentioned by Lathrop, would be $905 million next fiscal year. That’s an increase of $53 million, or 6.3 percent, from the current year. But under the current state aid formula, schools would have gotten an additional $80 million, or more than an 11 percent increase, next year. Despite the concerns raised by Lathrop, senators voted 33-0 to give first-round approval to the proposed Water Funding Task Force. If it is ultimately approved, the task force’s recommendations would be due early next year. The cost of the study itself was estimated at $3 million, but Carlson agreed to work on reducing that cost before the next round of debate. Will Nebraska legislators boost the minimum wage?